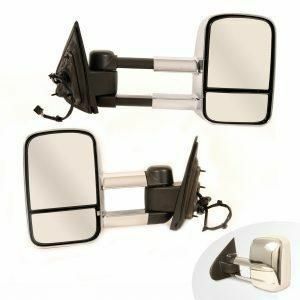 What you want with any caravan towing mirrors, is ease of installation, good rear view visibility, and they MUST be Sturdy. There is nothing more annoying, than having to pull over to the side of the road, after a semi has passed you in the opposite direction, and the force of the rushing air, has dislodged your drivers mirror. Another gripe I have, is poor design, that allows your extended rear view mirrors, to constantly vibrate, rendering them almost useless, unless traveling really slow with no oncoming traffic. I'm quite sure, you don't want to ruin your travels, by constantly stopping every few kilometres, to adjust a mirror that’s moved, due to wind vibration, or bumps in the road. The mirrors shown above Suit Nissan Patrol 1997 on-wards. These have a standard Nissan Factory wiring harness already wired in, so basically its simply a matter of removing the original mirrors, connect the wiring harness and bolting these new replacement towing mirrors in place. Now you can take advantage of the extra length when pulled out to give an extra 100mm rear view visibility, plus large 200mm x 175mm flat main mirror with a 75mm X 175mm wide angle black spot mirror below it.